Cultural Resource Management (CRM) refers to the discovery, evaluation, and preservation of culturally significant sites, focusing on but not limited to archaeological and historical sites of significance. CRM stems from the National Historic Preservation Act, passed in 1966. 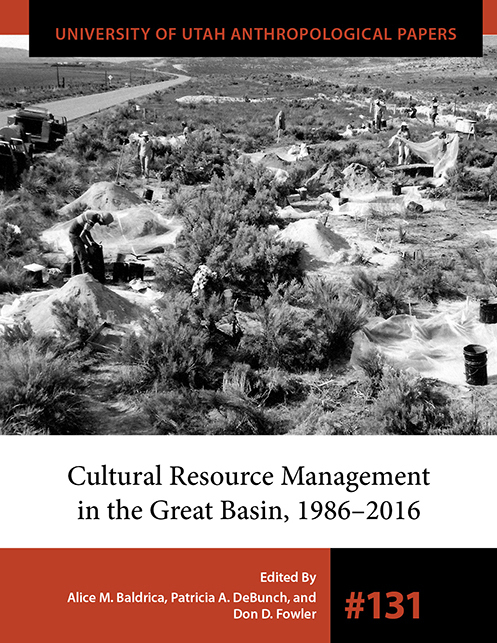 In 1986, archaeologists reviewed the practice of CRM in the Great Basin. They concluded that it was mainly a system of finding, flagging, and avoiding— a means of keeping sites and artifacts safe. Success was measured by counting the number of sites recorded and acres surveyed. This volume provides an updated review some thirty years later. The product of a 2016 symposium, its measures are the increase in knowledge obtained through CRM projects and the inclusion of tribes, the general public, industry, and others in the discovery and interpretation of Great Basin prehistory and history. Revealing both successes and shortcomings, it considers how CRM can face the challenges of the future. Chapters offer a variety of perspectives, covering highway archaeology, inclusion of Native American tribes, and the legacy of the NHPA, among other topics. Alice M. Baldrica is a retired archaeologist, formerly in charge of review and compliance at the Nevada State Historic Preservation Office. After retiring in 2010, she worked as a consultant preparing memoranda of agreement and programmatic agreements on mining projects in the western United States. Patricia DeBunch has worked as a private archaeologist for Idaho and Nevada from 1978 to 1991 and as an archaeologist for the Nevada Depart­ment of Transportation until her retirement in 2010. She co-founded of Eetza Research Associates. Don D. Fowler is Mamie Kleberg Distinguished Professor of Historic Preser­vation and Anthropology Emeritus, University of Nevada, Reno, and a past president of the Society for American Archaeology.